Marketing is pivotal to the success of any business. Many of the entrepreneurs I mentor, often want help on creating a successful marketing strategy. Properly executed, this can elevate your profile, increase brand awareness and drive sales. It can also serve as a key differentiator for your business in the marketplace, giving you a competitive edge. A recent example of smart, effective marketing is Nike’s “Margot vs. Lily” campaign, an original YouTube series about two highly competitive and athletically-minded sisters. The production, which artfully incorporates many images of Nike gear, was received favorably by millennials—the coveted audience Nike was targeting with its cleverly-done long-form ads. By diving deeply into this information, you will be able to better understand your business and any potential competitive advantages you can build on. You can also determine who your core audience is and how to best market to them. Once this is complete, you will be able to decide which marketing methods—-online marketing, traditional public relations or direct marketing, etc.—will be most effective. In today’s data-driven world, quantifiable results are essential. Many businesses use data-rich insights to guide their marketing efforts to better understand how to serve their customers. This provides crucial information about your target audience. This data can also help you establish goals to determine what works and what doesn’t. To maximize this approach, focus on numerical facts rather than vague aspirations. This means outlining quantifiable goals. For example, instead of wanting to improve customer experiences, your goal should be to raise your Yelp rating by half a star in the next three months. As you roll out a marketing campaign, establish hard targets and track your progress. These can include sales or online metrics like the number of followers you have or their engagement via comments. Used correctly, this data will provide an accurate verdict on the efficiency of your marketing strategy. A marketing strategy shouldn’t be static and unchanging, but rather a dynamic set of ideas that can be modified and revised as new information develops. This means reviewing your strategy every few months to ensure it is working as designed. Market conditions change incredibly quickly, so you need to be nimble and adapt accordingly. It is also important to develop a budget for your marketing strategy. Remember, marketing is an investment, and you will need to treat it as such. The good news is that a great marketing strategy can return your investment tenfold. Keep this in mind as you earmark funds for marketing. Be wary of going over budget and delving into funds that help you run your business smoothly on a daily basis. A smart marketing strategy can help your business break through to the next level and beyond. 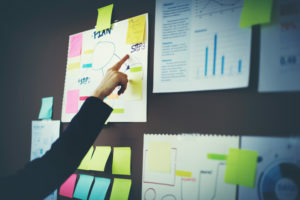 Incorporate these four tips to develop an effective marketing strategy that will make you stand out from your competitors. To learn more about innovative marketing strategies, join me and other leading experts, including two from Google, at my “Breakthrough Marketing for Breakout Sales” conference on April 14, 2017 in Scottsdale, Arizona.